This solar electric system will offset nearly 15,000 lbs of C02 emissions each year. Thomas College will use the system as an educational tool in the community as well as enjoying energy savings. 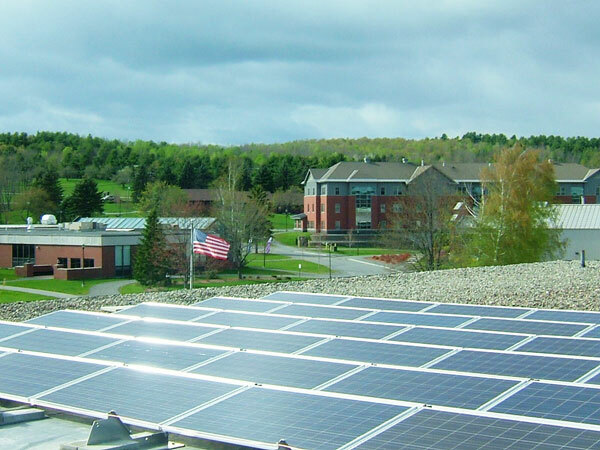 Last week ReVision completed installation of a new 8.28kw solar electric system on Thomas College in Waterville, Maine. The system will produce roughly 11,170 kilowatt hours of clean electricity each year, saving roughly $1,600 each year and offseting more than 14,700 lbs. of CO2 annually. Directing the project on behalf of Thomas College was Chris Rhoda, a ReVision Energy customer who happens to have solar electric and solar hot water installed on his home! We featured his family in our blog last year. In addition to saving money and reducing emissions, Thomas College hopes to use the system as a springboard for sharing information about renewable energy to the Kennebec Valley area, and plans to develop an interactive website. The website will include background about the project, technical information, and system output data that will be available to the public. The project was made possible in part by a grant from Efficiency Maine, which awarded a $50,000 grant to the college for the grid-tied PV solar power panel installation. More information about the system is available in Thomas College’s press release.